The Marlboro Development Team is constructing a Class A speculative industrial building in Dillon County on Harllee’s Bridge Road. In January, Marlboro Development Team (MDT), a wholly-owned subsidiary of Marlboro Electric Cooperative (MEC), began construction on a new Class A speculative industrial building in the Northeastern Commerce Center. “In today’s real estate environment, industrial prospects are looking for a finished product, which allows for quicker time-to-market while they are evaluating potential sites. MDT followed this same outline with our previous spec building in Dillon. 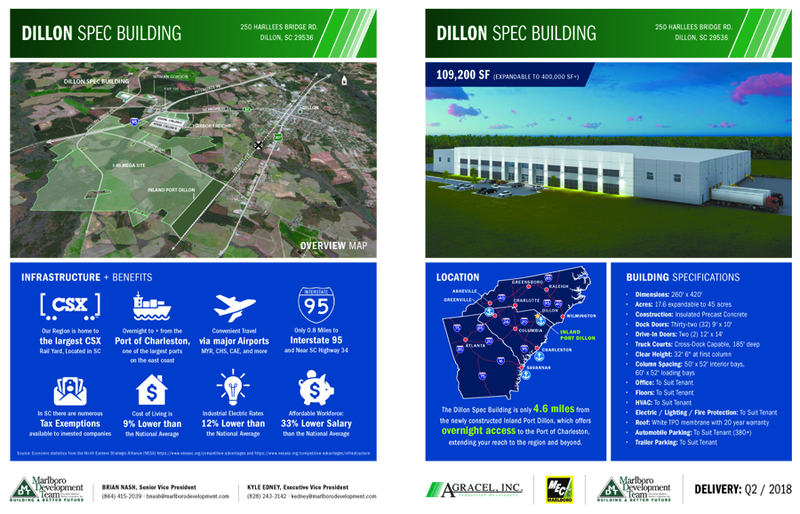 A completed shell building was an instrumental tool in locating a Fortune 500 Company in the county.” explained William L. Fleming, Jr., President and CEO of Marlboro Electric Cooperative, Inc. and of Marlboro Development Team, Inc.
“This new spec building will provide Dillon County with a showcase property to continue to attract potential industries and further economic growth,” said Fleming. This newest facility will be located near advanced manufacturer, Wyman Gordon and logistics center Harbor Freight Tools, which is currently undergoing a $100 million expansion. This $4+ million investment by MDT is an effort to capitalize on the recent $50 million investment by the South Carolina Ports Authority in the newly opened Inland Port, located four miles from the building. The 109,200 sq. 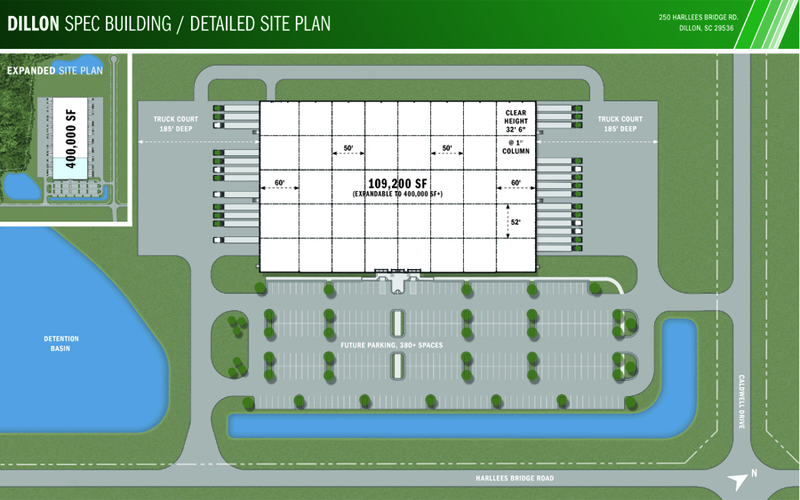 ft. speculative building will be complete in August and was designed to meet the needs of any advanced manufacturer who would like to capitalize on the lowest electric rates in the Southeast or a logistics company desiring proximity to I-95 and the Inland Port for import or export of goods. The insulated precast concrete building is expandable to over 400,000 sq. ft. and is designed to accommodate a cross-dock user with up to 32 dock doors, ample trailer and employee parking, 32’ 6” clear height, 50’x52’ interior column spacing with 60’x52’ loading bays, and a 20-year roof warranty. Clear-story windows are incorporated into the exterior walls to allow for an infiltration of natural light. The architectural two-story entry feature can accommodate any amount of office space a company may need and provides them with a facility they would be proud to call home. The building is available for sale or lease. MDT and MEC are proud to bring this much needed infrastructure to Dillon County as it will be greatly beneficial in the recruitment of new jobs and capital investment. The team of MB Kahn (General Contractor), Thomas & Hutton (Civil Engineer), McMillan Pazdan Smith (Architect), and Agracel were instrumental in bringing this project to fruition. Time lapse footage of the construction process can be viewed at the below link. https://www.workzonecam.com/projects/agracel/dillonspec/workzonecam/.